Are you the leader your organization has been waiting for? What are the key characteristics or qualities of a good leader? It’s a question that leaders often ask. The leadership literature offers many models, lists and research data to influence the point of view of the reader. My approach is to pose reflective question designed to facilitate the individual leader’s journey. As one HR executive reminds me, time to reflect and think is critical to her success. Here are some reflective questions to get you started. What leader has inspired you in your past and what about their behavior and their conduct with you is memorable to you? What have experiences with past ineffective leaders taught you about what doesn’t work in a leader? What one leadership moment stands out for you above all others? As a part time faculty member teaching in the Master of Arts in Leadership Program at Royal Roads University, I am often asked by learners, but “how do I get from here to there on my leadership journey?” The question might be about modeling the way of work life balance, more effectively addressing conflict in relationships, or showing up more authentically in the organization. Regardless of the specific issue, I remind them of Peter Block’s book, The Answer to How is Yes! and encourage them to explore not “how” to accomplish their desired outcome, but to begin instead to explore what next step will move them in the direction they wish to achieve. What one next step will get me closer to my desired goal? What might I be doing to get in my own way of achieving this outcome? Whose support do I need to be successful? What one action am I committed to taking today to help me on this journey? Be mindful of the temptation to believe you are on a solitary journey. Consider the possibilities of engaging others in your quest. By doing so, you will be inviting people to support you on your leadership journey and you will also be declaring your intentions verbally. This verbal declaration increases accountability for the outcome. If this is something you really desire, why wouldn’t you share it out loud? Beth Page is delighted to announce the online launch on March 30, 2011 of her new book Change Happens. 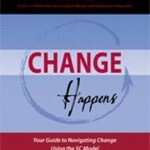 Visit www.changehappenseveryday.com to learn more about this new book. As a thank you for supporting the March 30 launch, several downloadable tools will be available as a thank you. Beth Page, owner of Dream Catcher Consulting and a long time member and volunteer with BC HRMA, is a seasoned Organization Development consultant who teaches in both the MBA and Master of Arts in Leadership Programs at Royal Roads University. Her consulting practice is dedicated to leveraging the value of the human dimension in organizations to achieve superior business results. To learn more, follow ChangeWisdom on Twitter.